Kolkata, Feb 8: Prime Minister Narendra Modi addressed yet yet another public rally in West Bengal on Friday, giving a fresh thrust to the BJP’s campaign blitzkrieg ahead of the Lok Sabha polls amid escalating tensions with TMC chief Mamata Banerjee. The rally, Modi’s third in the state in a week, comes three days after Banerjee called off her sit-in protest against “politically motivated” attempts by the CBI to question Kolkata police chief Rajeev Kumar in the Saradha chit fund scam case in which several top TMC leaders are allegedly involved. Those who got power in Bengal in the name of “Maa, Maati, Manush” have adopted the culture of violence, says PM Modi attacking Mamata government. Adding that the TMC government has rendered people helpless, PM Modi said that it has defamed the soil of West Bengal. Hitting out at Mamata Banerjee’s leadership, PM Modi said, “Didi dreams of becoming the PM, but is not concerned about Bengal. 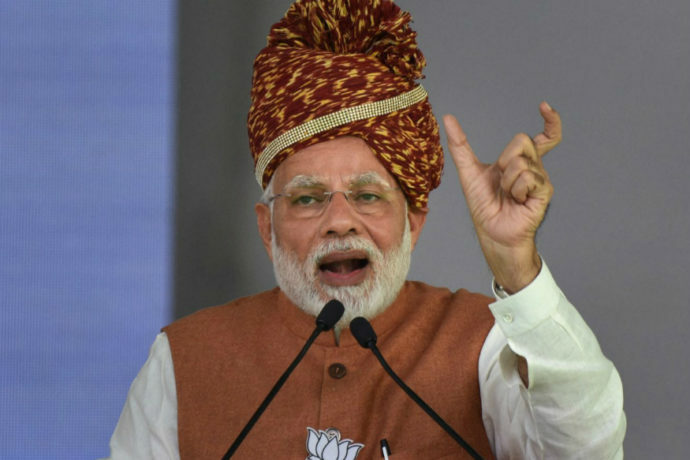 The TMC has only promoted bloodshed in the state.” Modi vowed to get “rid of the Syndicate raj in Bengal”, PM Modi said the BJP is determined to work in Bengal. “The BJP has given farmers a pension of Rs 3,000 per month and by 2022 every India will have a home. This is my mission,” the PM said. Speaking about his government’s contribution to Jalpaiguri, PM Modi said, “We have inaugurated a High Court Bench here so that people do not have to go to Kolkata.” Taking on the Congress, TMC and the CPIM together, the PM charged all three erstwhile governments for not caring enough for the people of Bengal. Earlier Mr. Modi laid the foundation stone for a four-lane highway in Jalpaiguri.